I tried to count Target's whiskers the other day but he's too ticklish. Every time I get through counting the big ones, he starts to wriggle, purr and chew my fingers. So I got clever and took his picture. I see 15 whiskers here. That's 3 more than the average. Hmm, does that mean he's smarter than the average cat or just fuzzier? Please note there will be no Star Weekender printed this weekend because of Deepavali (Hindu festival of lights holiday). So there will be no Dog Talk! 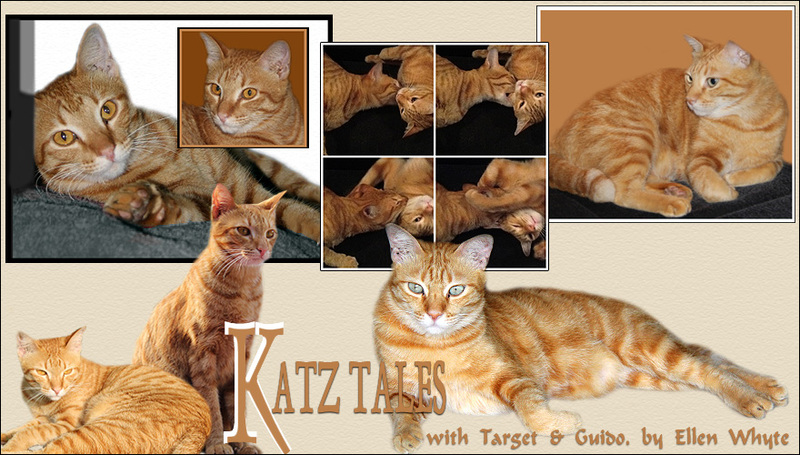 To make up for it, I'll write a Katz Tales and Dog Talk cross-over story, and post it on this blog this Friday. FYI Katz Tales the book is still sitting in the warehouse. The distributors are getting ready and HOPEFULLY the book will be out in the shops soon. I'll let you know when it happens. For more kitties, check the side menu or visit Gattina. I think that means that he is smarter than the average cat! More whiskers, more brains, obviously! Have tried counting my cats' whiskers too. Very difficult. Read somewhere that pedigrees have more whiskers than the norm. thank you for stopping by. I wish I could join Cats on Tuesday but Im quite buzy. I will try my best to join in some other time. That's what we've heard...the more whiskers a cat has, the smarter he is!! We certainly think more whiskers means he's smart and handsome! Hehehe, I have tried counting her whiskers too. In fact in your previous post, about the decibels, now I know why she is waiting for me when I come home, because she hears the car alarm. Just give me a holler when the book is out. I am too exited for you! I hope it will be available on line. ok book, see u soon. Counting whiskers ? Now, that's an occupation I haven't thought of yet, lol ! Thanks for the tip now I know what I can do to fill in my day hahahaha ! Whiskers? I am not sure if Prudence and Muning has it haha. I'm gonna check it out now! That is a wonderful close up of you Target! Thanks for the kind thoughts to mom! Counting cat whiskers seams to be lot of work. I always count the whiskers I found on the Sofa. Lunas whiskers are very hard and long. Sometimes she lost one. Love the close up picture of Target today! He does look like a smart cat, indeed. And the mommy is surely very smart to take a still photo to count the whiskers...haha! Oh noes, now mum wants to count my whiskers too! This is No Good! Just like Lilian Jackson Braun's book the Cat With 60 Whiskers! What a great closeup shot, he is such a handsome cat. Happy COT! That is a clever way to count whiskers! Target seems like a real sweetheart. Of course I approve his gingerness! Yes, I think maybe I am part bear - I certainly seem to sleep like a hibernating one sometimes. I think it would be hard to count whiskers! He HE. Oh, we're sure he's smarter! :D That's a cute close-up of him! oh dear Target, you have fabulous whiskers! Target your whiskers are just wonderful. I am sure the extra ones means that you are extra smart. Definitely smarter and whiskerier! What a laugh that must have been, tickling Target's whiskers.